Parishioners of all ages use smartphones and apps to connect everyday and are ready for their parish to go mobile. Not only could they keep up to date with church events and notifications but they could have prayers, readings, and reflections in their pocket at all times. A first-of-its-kind app for iOS and Android devices, myParish helps build stronger Catholic communities and better engage the New Evangelization. If that wasn’t enough, your app is up and running before you even touch it. 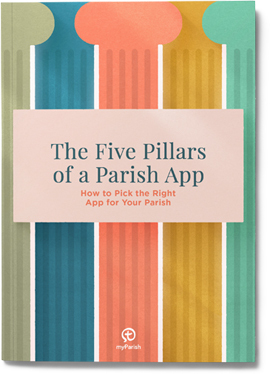 Work with it for a day and your app would be tailored to the needs of your parish. A powerful, yet low maintenance tool that brings you closer to your parishioners. Inspire a deeper faith walk, strengthen Catholic community, and foster involved parishioners. Connect with parishioners throughout the week with updates, news, events and more! Feature events around the parish. Parishioners can RSVP, add to calendar, share and get directions via your app! Share daily Mass readings from the USCCB with your parishioners! Parishioners can bookmark their favorites. Quickly provide all important contact information. Complete with Staff directory and School info if needed. Easy-to-set reminders to help eliminate distractions and disruptions while at the Church. Give your parishioners quick access to online giving. Connects to all online giving solutions. An easy way to make available your homilies in video, audio, or text formats. List your Mass times for the week with built in reminders for the parishioner to silence their phone. Provide your parishioners with many common Catholic prayers. Parishioners can even set prayer reminders too! Display available times. Helpful Confession Guide. Parishioners can set useful reminders for next confession. Make your bulletin available to all parishioners while they are on the go. Your app will be updated automatically with the latest Catholic news! Start group discussions with other parishioners. Optional faith-building resources to inspire your parishioners. Baptism or funeral announcements, special Mass times for holy days, news—let them know as soon as you know. We will provide your parish with a full suite of marketing materials to help promote your app in print, email, web and social. Mass readings, Catholic news, easy prayer reminders, this week’s homily and bulletin—all quickly accessible. myParish is easy to use and takes very little time to post info to your app. Simple and secure administration with our staff always there for you. Cell phone interruptions will become a thing of the past with convenient phone silencing reminders. Your app is available for both iPhone and Android smart phones. This means just about every parishioner with a smart phone can use it. Have questions or want to sign your parish up? It’s simple. Email us below or give us a call.